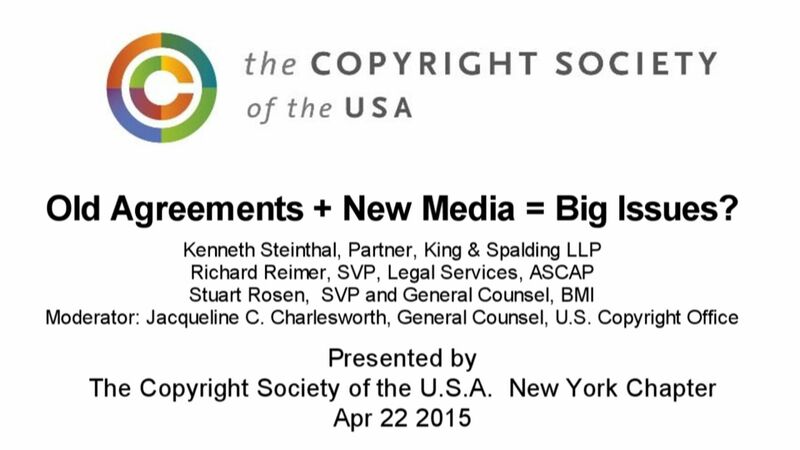 On April 22 2015 the Copyright Society of the USA’s New York Chapter presented a luncheon panel – Old Agreements + New Media = Big Issues? Performing Rights Organizations, Rate Courts and the Department of Justice – at the Princeton Club in NYC. For decades, ASCAP and BMI have been subject to antitrust consent decrees with the Department of Justice, which include restrictions on the ways in which these Performing Rights Organizations can and can’t issue licenses and a framework on how disputes over royalty rates are to be resolved. Recent rulings in the “rate courts” have addressed the ability of publishers to withdraw their performing rights for certain digital uses, with different results coming out of the separate ASCAP and BMI proceedings. With these developments leading to headaches for licensors and licensees alike, everyone is starting to ask whether the consent decrees and rate court procedures themselves should be overhauled. Last year, the DOJ opened both consent decrees for review, asking important questions about their relevance and effectiveness. A panel of experts discussed the key considerations. Speakers: Richard Reimer, Senior Vice President, Legal Services, ASCAP; Stuart Rosen, Senior Vice President and General Counsel, BMI; Kenneth Steinthal, Partner, King & Spalding LLP. Moderator: Jacqueline C. Charlesworth, General Counsel and Associate Register of Copyrights, the U.S. Copyright Office. Video/audio is below.